For the first time those who are not well suited to writing code can finally create their own custom MODs and features for their controllers using a visual interface. By dragging and dropping GPC Blocks on to a blank canvas, the user can create simple and complex modifications visually without writing a single line of code. This code can also be tested and programmed on to one of the 9 Titan One memory slots for use in-game with the click of a button. Internet connection is required to access the Visual Scripting features. Internet Explorer 10.0 or higher is required to run the Visual Scripting. • IO Entries: References to the controller inputs (buttons, analog sticks, sensor, etc). • IO Functions: Special GPC blocks to access and manipulate IO Entries. • Logic: Blocks for complex conditions used in decisions. • Math: Blocks for calculating. • Combos: Pre-made GPC combos. A set of actions programmed to be automatically performed in sequence. • Rapidfire: Basic Rapidfire Blocks. 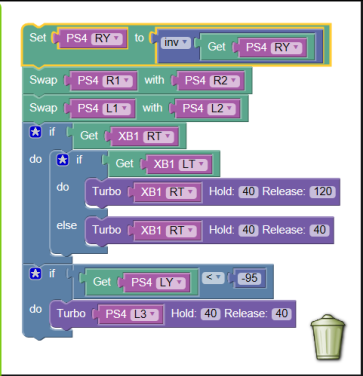 • Rapidfire X: Conditional/Advanced Blocks. • Bumpers/Triggers Swap: Swap the bumper and triggers to convert your controller to Xbox to PlayStation style or vice versa. • Easy Sprint: Your character will sprint if the thumbstick is FULL pressed forward. The character will walk regular speed if the thumbstick is only slightly pressed forward. • Quick Scope: Quick scope is to use with a sniper rifle. It scope IN and fire the shot as the gun scopes in. Perfecting the aiming and timing will allow you to become a one-man commando with your sniper rifle. • Hold Breath: Automatically holds the sniper's breath when scoping in. The player no longer has to push the left thumbstick to hold breath. • Double Jump: Automatically performs the highest double jump just by pressing the jump button. • Invert Y Aim: Blocks to invert the direction on the Y aiming axis. The toolbox contains GPC blocks which you can use to build a GPC script in the workspace. To use the GPC Blocks, click on any of the block and drag it into the workspace. The white area where the GPC Blocks are gathered and connected. 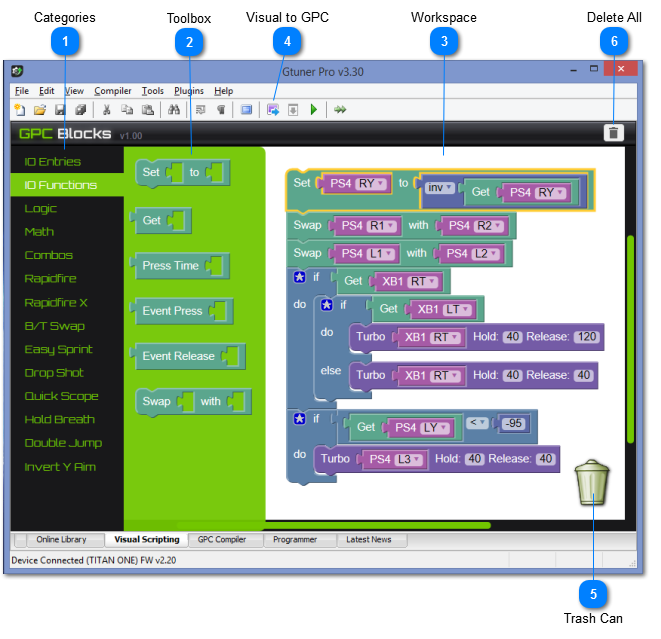 • Add blocks to the workspace: Drag the blocks from the GPC Block toolbox. • Delete blocks from the workspace: Right click and choose delete, or simply click the intended block and hit the backspace key. • Disable blocks so that the code will not be generated: Right click on the block, and choose disable block. The block will become semi transparent as an indication. A disabled block can still be selected and enabled. • Collapse blocks to save space: Individual blocks can be collapsed. Right click on the block and choose collapse block. As a result, all inputs of the collapsed block will follow suit. The blocks can be expanded again, by right clicking the block and choosing the expand block option. Note that this is different from expanding blocks to show different functionalities at different levels. • Copy a block: Right click on the block and choose duplicate. Another option is to click the block and press Ctrl+C and then Ctrl+V keys. Generate and open the GPC Script equivalent to the GPC Blocks structure currently in the workspace. To delete a GPC Block, or a group of blocks, drag it to the trash can. Or highlight the block, and press "Backspace" or "Delete". Clicking on this button will delete all blocks in the working space.